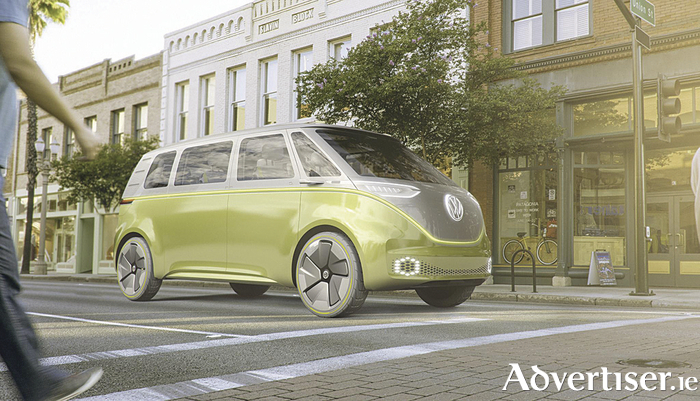 The driverless van has taken a step closer to reality thanks to a new concept vehicle revealed by Volkswagen at the recent Detroit Motor Show in the USA. The German firm’s concept van, which draws heavily from the styling of the iconic VW Type 2 ‘Microbus’, is called the ID Buzz and will drive itself using laser scanners and ultrasound sensors, while having a pure electric range of 372 miles on a single charge. The company says the technology shown on the van could feasibly reach the market by 2025 – a deadline that VW Group has set to sell one million electric vehicles per year. The all-wheel drive ID Buzz is powered by two electric motors – one at the front and another at the back – with a combined 372bhp, meaning it will accelerate from 0-62mph in just five seconds, which makes it almost as quick as premium brand electric cars such as the Tesla Model S.
The tech behind the van’s fully autonomous ID pilot system uses laser scanners, ultrasound sensors, cameras and radar to guide the van on both open roads and congested city centres. Its integrated Wi-Fi hub automatically downloads the latest traffic data and plots its optimal route to avoid congestion or traffic incidents. The driver will be able to take control at any point by taking hold of the steering wheel, while a head-up display will also show speed limits, 3D navigation commands and battery status. The German firm has already committed to bringing an electric van to market, with the imminent launch of the all-electric eCrafter. Based on the company’s recently launched heavy van, the electric version of the Crafter will go on sale later this year, following its reveal at the IAA Commercial Vehicle Show in Hannover last September.